NASA explains that Pluto's overall hue is "believed to be a result of ultraviolet radiation from the distant sun breaking up methane that is present on Pluto's surface, leaving behind a dark and red carbon-rich residue". 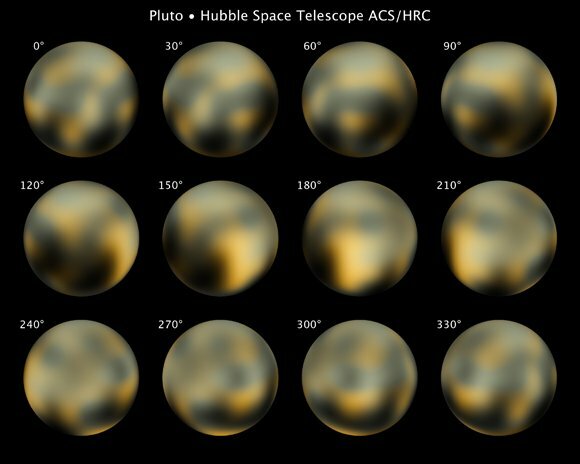 The above photos are constructed from multiple snaps taken in 2002 and 2003*, and when compared to Hubble images captured in 1994, show that Pluto's surface has undergone significant "seasonal changes". NASA explains: "Pluto has become significantly redder, while its illuminated northern hemisphere is getting brighter. These changes are most likely consequences of surface ices sublimating on the sunlit pole and then refreezing on the other pole as the dwarf planet heads into the next phase of its 248-year-long seasonal cycle." The agency singles out the 180° view as of special interest, since it shows "a mysterious bright spot that is unusually rich in carbon monoxide frost". This is now a "prime target" for the New Horizons flyby in 2015, during which the spacecraft will have a single chance to capture one of Pluto's hemispheres as it whizzes past the dwarf planet. The Hubble pictures will accordingly aid NASA in picking the best viewpoint for New Horizons, while helping scientists to calculate optimum exposure for the spacecraft's camera. * NASA elaborates: "The Hubble images are a few pixels wide. But through a technique called dithering, multiple, slightly offset pictures can be combined through computer-image processing to synthesize a higher-resolution view than could be seen in a single exposure." Investigator Marc Buie of the Southwest Research Institute in Boulder, Colorado, said: "This has taken four years and 20 computers operating continuously and simultaneously to accomplish." NASA describes Pluto as "arguably one of the public's favorite planetary objects". We'd argue that this is only true for some residents of Illinois, who are still hacked off by the International Astronomical Union's 2006 decision to boot the object out of the league of proper planets.